You are here: Home / What is GreenToe.com? GreenToe.com is a next generation e-commerce marketplace that enables consumers to set the price on the products they want to buy. Created to change the way people shop, Greentoe.com shakes up the traditional retail model by putting consumers in the driver’s seat. They make an offer on a product and the site connects them to the retailers who are willing to accept the offer. The site benefits both consumers and retailers – shoppers can buy products at the lowest price available and retailers reduce inventory and find new customers. Have you ever been to Mexico or China? Think about commerce there? Do you ever buy something for the price the seller is offering? No. You haggle; you wheel and deal and you get a much better price. Well, Greentoe.com was founded with the same concept in mind. Why agree to the initial price? Make an offer and see what happens. This time, instead of dealing with a local salesman on a beach, you are instantly tapping into a network of online retailers. So, the concept is the same. But, the technology, the network, and the products are much different. 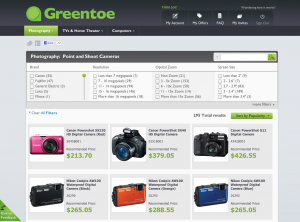 On Greentoe.com, there are tens of thousands of products ranging from Canon and Nikon cameras to Sony and Samsung television. The site incorporates expert and user reviews. So, if you aren’t sure what product or model you want, Greeentoe.com’s library of product content can help you make a decision. Once you choose the product you want, you enter your credit card, and your offer is instantly distributed to our vast network of certified retailers. The first retailer to accept the offer makes the sale. Just like the merchant on the beach, right? Well, not exactly. Greentoe.com was founded with two things in mind – save time and save money. Ever spend a whole day driving around to stores looking for the best price? How about an entire evening surfing websites all night looking to save a buck? Those days are over. Go to greentoe.com, find the Canon camera you always wanted, pick a price that you want to pay for it, and just sit back and relax. No gas, no parking, no aggressive salespeople. E-commerce has certainly evolved since the early days of Amazon.com. There has been a flood of group buying site, group buying aggregators, and flash sale sites. But, all those sites dictate what products are on sale making most of the offers rather useless. With Greentoe.com, you pick the product you want and the price you want to pay for that product. It is that simple. So, next time you are looking to upgrade your television or buy a brand new home entertainment center or simple looking for a new set of headphones, make sure you go to Greentoe.com first and place an offer. You will be very happy that you did. Just remember that commerce is thousands of years old and working a deal goes all the way back to the stone ages. Step into the new age of commerce with Greentoe.com.